I'm estatic! Seriously. 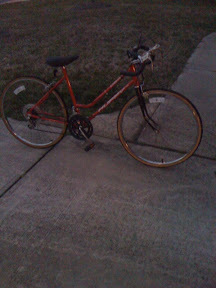 Saturday was a very busy day for me & I was uncertain if I was going to be able to purchase this bicycle that I saw listed on CL. I would've purchased a new bike, but what I need it for, I could get w/used. It's nice. Going to take some time for me to get adjusted to riding it because it's a road bike. Balancing & pedaling is a little harder at 26 than my early teens. I had so much fun pedaling earlier that I'm a little sore. It's ok though. I've got my iTunes mixed, my bicycle, and Dino. Life's great! You like? Great buy! I love my bike!I purchase mine from a site similar to CL as well. It really makes things a lot easier and give you exercise!